Cosby Sexual Assault Case Is Cleared To Proceed : The Two-Way A Pennsylvania judge has refused to throw out the case against Bill Cosby, rejecting a former district attorney's claim that he granted the comedian immunity from prosecution a decade ago. Bill Cosby arrives for a court appearance Wednesday in Norristown, Pa. The judge has ruled that the case against him will proceed, despite a claim that he was promised immunity a decade ago. A Pennsylvania judge has ruled that a sexual assault case against Bill Cosby, in which the comedian is accused of drugging and assaulting former Temple University employee Andrea Constand in 2004, will go to trial. Judge Steven O'Neill refused to throw out the case, rejecting a former district attorney's claim that he granted the comedian immunity from prosecution a decade ago. The decision largely hinged on the judge's view of former Montgomery County District Attorney Bruce Castor's statements about whether Cosby should face charges, according to The Associated Press. 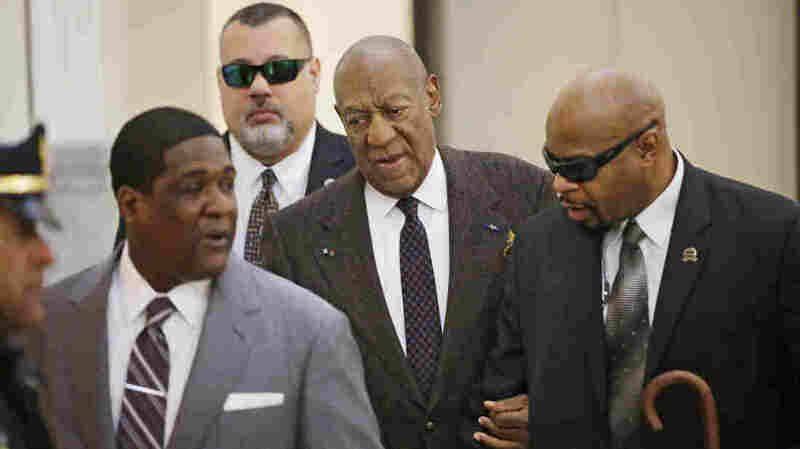 Castor had said that he gave an unwritten promise of immunity for Cosby to his now-deceased lawyer, contending that Constand's lawyers wanted the agreement so Cosby would be free to testify in her civil suit. Now the case moves to a preliminary hearing to determine whether prosecutors have enough evidence to prove Cosby assaulted Constand.